14k? 18k? Rose? White? Here's how to decide. 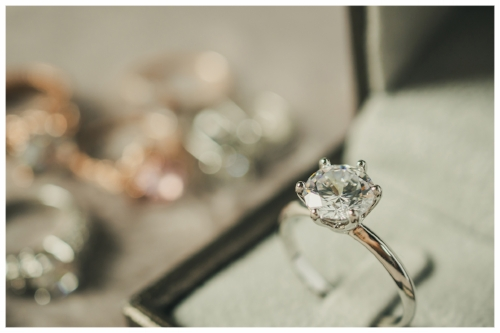 While finding the perfect diamond or gemstone is seen as the most important part of buying an engagement ring, choosing the right metal for your ring is also essential. You’ll want to keep in mind the durability, visual quality, and price of the metal, as well as how it will look with the center stone and your future wedding bands. With this quick overview of the different metal types, you’ll be in a much better position when discussing your ring with a jeweler. 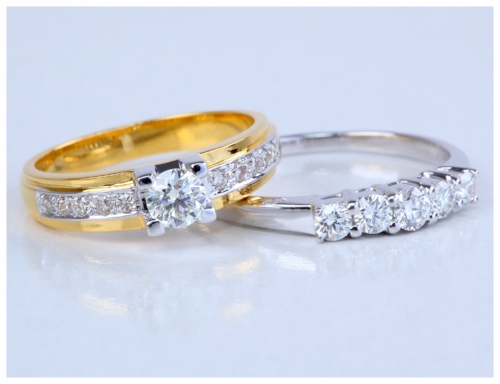 Yellow gold has traditionally been one of the most popular choices for engagement rings. Unlike gold of other colors, yellow gold doesn’t need to be replated over time. Yellow gold rings tend to look best with colorless diamonds, but other gemstones can work too, depending on the color. It also looks great on people with warmer skin tones. White gold is currently trendy, and if you’re looking for a more colorless metal, it’s a less expensive choice than platinum. Of course, as it’s derived from yellow gold, it won’t have quite the same white color as a platinum ring. However, rhodium plating is a good choice if you want to make your ring a little whiter. Although more of a niche choice, rose gold can be the perfect complement to your center stone. The most romantic out of the all the metals, rose gold also tends to be the most durable. Because it’s formed by mixing gold and copper, make sure your significant other isn’t allergic to copper metal. Gold used in jewelry is very rarely 100% pure gold; rather, it’s mixed with alloys in order to make the metal more durable for a ring. 18k gold has more pure gold (about 75%) compared to 14k gold (around 60%). As a result, 18k is more expensive and has a richer yellow color, but its additional gold content means it’s slightly softer. 14k gold has a less vibrant yellow, but it makes for a more durable ring. Which type of gold you choose has to do with your budget and what you place more value in, whether color or durability. Anything lower than 10k gold typically isn’t desired for engagement rings. Platinum is one of the most sought after metals for engagement rings. It’s highly durable, 95% pure, and naturally white and lustrous. Due to its rarity and other desirable characteristics, platinum is a more expensive choice than gold. Platinum is also hypoallergenic and won’t cause an allergic reaction, unlike some other metals. Although it won’t need any replating that white gold might, it might require repolishing years down the line. Palladium engagement rings are becoming an increasingly popular choice. Like platinum, it’s hypoallergenic and has a similar white color, but it’s a lighter, less dense material. Although it’s usually less expensive than platinum, prices have been rising in recent years. If you’re considering a silver engagement ring, it’s best to go with sterling silver, which is 92.5% pure. Silver is the least expensive out of all the other metals, so it can be a good choice if you’re on a budget. Unfortunately, silver tarnishes over time and can start to lose its color in less than a few months. So Which Engagement Ring Metal Should You Choose? It all depends on what you value the most for your engagement ring, and what looks best with your center stone and other gemstones. If you want an extremely durable metal that will last a lifetime with little adjustment, platinum or palladium is probably the best choice. If you want something unique and romantic, rose gold can be a great pick. If you’re on a tight budget, silver can work, though gold plating will help the ring last longer. In terms of the gemstone, blue diamonds and cooler gemstones like aquamarine tend to be better complemented with a platinum or white gold metal, rather than yellow or rose gold. But set a ruby or garnet on a rose gold ring, and you’ve got quite a stunning piece. If possible, discuss with your significant other about their preferences, and consult with a trusted jeweler for what metal works best with your gemstone. If you have any questions, feel free to send us a message and one of our expert jewelers will be sure to help you.